Hello from NAMM! NAMM is a trade show that stands for National Association of Music Merchants. Every year it is held in Anaheim, California at the Convention Center with upwards of 100,000 people in attendance. For the past three years, Berklee City Music staff have attended in order to meet with industry partners that can help benefit our City Music Network Members and School Districts. Every year that we have gone to NAMM, City Music has hosted an annual lunch for Network Members. This year, five members where represented: Phoenix Conservatory of Music, A Placed Called Home, RYTMO, The Roots of Music and Notes for Notes. The lunch is always a great opportunity for everyone to connect and give updates on new projects and initiatives they are working on. It is also a place to start collaboration, as many conversations at the lunch, much like at the Berklee City Music Summit, have lead to cross member projects. At this year’s lunch we received updates from our Vice President for Education Outreach, Lee Whitmore, on the Grammy Music Education Coalition, The Boston Conservatory and Berklee merger and news on our online music resources, the Berklee PULSE Music Method, that is now open to the public and will be translated into Spanish in the coming year. We also heard from each Member on news from their organization. Phoenix Conservatory recently moved locations to a larger facility that will better accommodate their growing student population and program offerings. RYTMO recently launched a new partnership with Learn 4 Life charter school in Anaheim where they are teaching course levels 1 and 2 and will soon be implementing levels 3 and 4. The night before A Placed Called Home and Charyn Harris were honored with the She Rocks Motivator Award from the Women’s International Music Network. Charyn is the conductor of the Music Program at APCH. Note for Notes has recently opened three new studios with their partners at Boys and Girls Clubs in Cleveland, Memphis and New Orleans and plan to open another five new locations in 2017. The Roots of Music is also looking at expanding their program with moving into a new location and creating an arts campus in New Orleans with other partners, including another Network member in New Orleans, Tipitina’s Foundation. And what lunch would be complete without a traditional selfie? Check out our Instagram to see it. After lunch we headed from the Marriott to the Convention Center to say hello and thank you to our friends and partners at Casio. The Casio Musical Instruments Division has been a fantastic partner over the past two years, donating more than 150 keyboards to Network Members, including those who attended the lunch. If you plan to attend NAMM next year in 2018, please make sure we know so we can see you at the lunch and connect! This past Tuesday, August 6 at 7:30pm the Berklee City Music Scholarship Concert was held at the Berklee Performance Center. As the culmination of the Berklee Summer 5 Week Performance Program, the Berklee City Music Scholarship Concert gave students the opportunity to showcase their musical talents. With performances ranging from rock, pop, and jazz to hip-hop and R&B, students had the audience mesmerized. Along with exceptional instrumentation, vocals, and choreography, students exuded the confidence of professional artists. Actress, Kiki Haynes kept the atmosphere relaxed and humorous throughout the night as she hosted the event. Her charisma and sense of humor carried the audience through the most intense point of the concert: the scholarship award announcements. 17 Four-year full-tuition scholarships to Berklee College of Music were awarded to City Music Seniors who excelled in both music and academics and demonstrated a commitment to their communities. Scholarships were awarded by Roger H. Brown, President of Berklee College of Music; J. Curtis Warner, Jr., Executive Director of Berklee City Music and Associate Vice President for Education Outreach; Dr. Krystal Banfield, Dean of Berklee City Music; and Kiki Haynes. The night ended on an inspirational note when the Choir, directed by Nichelle Mungo, sang “Hello Fear” by Kirk Franklin and “Let Love Awaken” by Planet Shakers. You can also catch them every Tuesday night at the Maple Leaf Bar in New Orleans or, if you are in town for the New Orleans Jazz and Heritage Festival, you see them perform this Saturday, April 27 at 3:40pm on the Congo Square Stage. Click here for Saturday’s schedule. The Rebirth Brass Band is committed to upholding the tradition of brass bands while at the same time incorporating modern music into their show. Their signature brand of brass funk has won over several generations of music lovers. 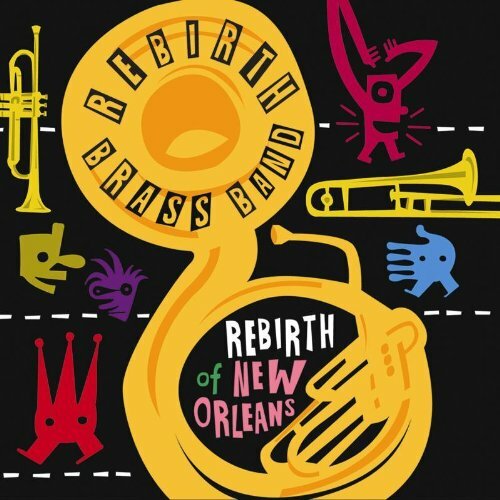 In 2012 the Rebirth Brass Band won its first Grammy for Best Regional Roots album for their album “Rebirth of New Orleans.” Be sure to listen to the them on our Jazz Appreciation Month playlist. Among the members of Rebirth is Derrick Tabb, who is the Co-Founders and Executive Director of The Roots of Music, a Berklee City Music Network Member. The Roots of Music runs year round music education and academic programs, providing kids ages 9-14 with programming in the areas of music, academic mentoring, positive behaviors, civic responsibility, and life skills where the goal is to give the youth of New Orleans the resources to live positive, productive, self-reliant lives. On Sunday, March, 24 the Class Got Brass middle and high school brass band competition took place at Congo Square in New Orleans. The competition is put on by the New Orleans Jazz & Heritage Foundation, which owns the New Orleans Jazz Fest. The competition was established to continue the New Orleans brass band tradition through middle and high school students. The bands compete in second-line parade fashion and must adhere to guidelines to promote and keep the brass band tradition. The bands are limited to a maximum of 12 members with only one bass drum, one snare drum, and one tuba. The competition is open to public and private middle and high schools from anywhere in Louisiana. This year all contestants received a gift certificate prize from the New Orleans Jazz & Heritage Foundation that may be used to purchase instruments, instrument repairs, and supplies. First place received $10,000, second place received $6,000, third place received $4,000, and all other participants received $750. Our three Berklee City Music Network members all play a part in many of the students’ lives who competed in Class Got Brass. Some of the students in the middle school bands go to The Roots of Music after school program, O. Perry Walker High School has an after school music program sponsored by Young Audiences of Louisiana, and some of the schools receive instruments through the Tipitina’s Foundation Instruments A Comin’ program. This year 17 bands competed and the competition was tight. It was a great afternoon of music. Check out the highlights video of the competition. 2nd Place: KIPP McDonogh 15 Middle School, Band Director – Kelvin Harrison, Sr.
Do You Know What Music Means In New Orleans? New Orleans has played a pivotal role in the development of American music, and Berklee City Music is fortunate to count three outstanding Network members from this cultural mecca. 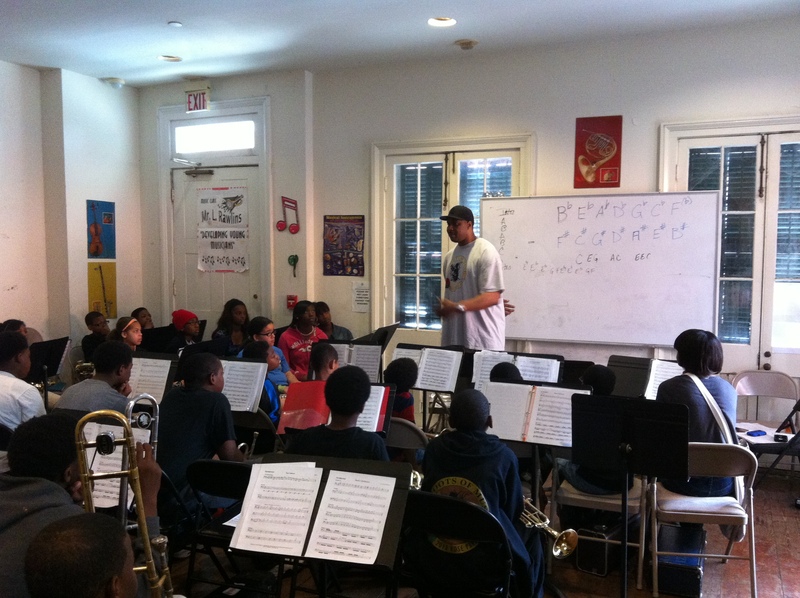 The Roots of Music offers tuition-free music education and academic tutoring, with its marching band continuing a proud tradition of the New Orleans community. The core faculty offers instruction in band, brass, curriculum and percussion while partnering with Tulane University to invite additional instructors. Among other accomplishments, the Roots of Music’s Marching Crusaders can be seen in the Tournament of Roses parade this January in California. Under the guidance of their artistic director, acclaimed saxophonist Donald Harrison, Tipitina’s Foundation teaches middle and high school students instrumental skills and recording/production techniques free of charge. Students also participate in workshops with musicians, producers, and scholars. In addition, Tipitina’s Foundation provides instruments to local schools and operates business development centers for artists across Louisiana. Students from Tipitina’s Internship Program recently travelled to Japan as part of a cultural exchange program. Young Audiences of Louisiana works in local schools to provide a variety of programs that combine the arts, academics and life skills to a range of audiences. Programs include afterschool and summer classes, community performances, artist residencies, early childhood arts instruction and professional development for educators. In November, Young Audiences received approval to open a charter school that will “emphasize academic excellence and use research-based Young Audiences arts-integration programs to engage students and support teaching and learning.” The school will open its doors in August 2013. These unique organizations preserve New Orleans’ rich musical heritage while educating and inspiring new generations. Berklee City Music is proud to partner with all three and congratulates them on their myriad accomplishments. StubHub has committed to donate up to an additional $50,000 (adding up to a $100,000 total donation) to The Roots of Music if the film reaches 50,000 views by Super Bowl Sunday. The additional $50,000 in funds would come from the StubHub Foundation, a corporate advised fund of Silicon Valley Community Foundation. Roots of Music uses New Orleans’ musical heritage as a stepping stone to changing lives. We’re an organization that helps at-risk kids through music education, tutoring and mentoring—unlocking their potential as individuals, and building a nationally-recognized marching band along the way.We’re using New Orleans’ musical heritage to build its future. It’s a big vision, but your support can make a huge difference in a child’s life—and eventually, an entire generation of New Orleans youth.